The KC Streetcar project is a two-mile route running primarily along Main Street in downtown Kansas City connecting Kansas City’s River Market area to Crown Center and Union Station. This modern transit option serves Union Station, the Crossroads Arts District, the Power and Light District, the city’s central business district, and the historic River Market/City Market along with numerous other businesses, restaurants, art galleries, educational facilities, and neighborhoods. The KC Streetcar has 16 stops spaced every two blocks for both northbound and southbound travel. The KC Streetcar Authority and vehicles are housed at the Singleton Yard Facility (Vehicle Maintenance Facility) located in Columbus Park. Want to explore downtown after your ride on board the KC Streetcar? Click here for the full PDF version of the Ride & Dine KC Streetcar Map. Click here for the Visit KC Interactive Map. 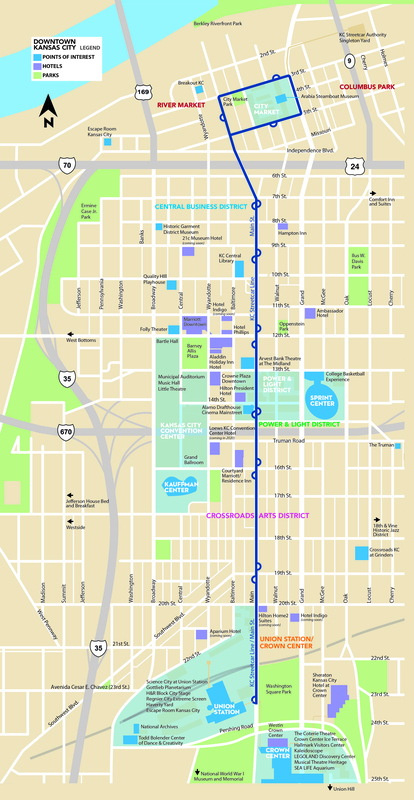 Click here for a full and printable KC Streetcar Route Map.